Kinmen or Quemoy (/kɪˈmɔɪ/; Standard Mandarin Pīnyīn: Jīnmén; Hokkien POJ: Kim-mn̂g (locally) or Kim-mûi), officially Kinmen County, is two groups of islands governed by the Republic of China (Taiwan) and located just off the southeastern coast of mainland China. The county consists of the Kinmen Islands (including Great Kinmen and Lesser Kinmen) and the Wuqiu Islands more than 110 kilometres (68 mi) to the northeast. It is one of two counties under the streamlined Fujian Province of the Republic of China. The Kinmen Islands are located only about two kilometres (1.2 mi) east of the mainland city of Xiamen, and their strategic position has reflected the significant change of Cross-Strait relations from a battlefront to a trading point between China and Taiwan. Due to the ongoing issue of the political status of Taiwan, the People's Republic of China (PRC) has continuously claimed Kinmen County as part of its own Fujian Province, claiming the Kinmen Islands as a Jinmen County of Quanzhou prefecture-level city, and claiming the Wuqiu Islands as part of Xiuyu District in Putian prefecture-level city. Kinmen was given its name (金門; Jīnmén; 'golden gate') in 1387 when the Hongwu Emperor of China's Ming dynasty appointed a military officer to administer the island and protect it from wokou (pirate) attacks. The name is pronounced Jīnmén in the official Standard Chinese but some of the various names used in English for the islands derive from other Chinese varieties. Quemoy is the name for the island in English and in many European languages and the island's name in postal romanization. It likely began as a Portuguese transcription of the Zhangzhou Hokkien pronunciation of the name, Kim-mûi. This form of the islands' name was used almost exclusively in English until the late 20th century and is still used widely in current English-language contexts that involve historical coverage. For example, current works that deal with the First and Second Taiwan Strait Crises (the Quemoy Incident) when the islands received prominent worldwide news coverage as "Quemoy" still use this form. In addition, the former National Kinmen Institute of Technology was renamed National Quemoy University in 2010. Kinmen scholar Wei Jian-feng advocates the use of "Quemoy" to better connect the island to "international society or achieve more recognition in the world". Kinmen is a more recent transcription based on the general rules of the postal romanization system. With some exceptions, this form is used in most current English-language contexts on Kinmen and in Taiwan as a whole. Entities such as the county government, the islands' airport, and the national park use this spelling. Chin-men is the Wade–Giles romanization form of the island's name and appears on some maps using that as their standard. Jinmen is the hanyu pinyin form of the island's name used especially in sources from the People's Republic of China. The Kinmen County Government and ROC central government have adopted Hanyu Pinyin as their standard romanization, such as for names of townships within Kinmen County, but this does not apply to the name of Kinmen itself. 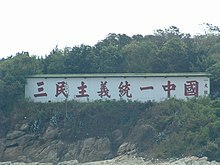 The slogan "Three Principles of the People unite China", written in traditional Chinese characters, the official script of the Republic of China(Taiwan), located in Dadan Island of Kinmen, facing Mainland China. People began settling down in Kinmen during the Tang Dynasty, changing the original name from Wuzhou to Kinmen. During the Ming Dynasty, more migrants came to settle down in Kinmen. Koxinga used Kinmen as a base to liberate Kinmen and Penghu from the Dutch. He cut down trees to build his navy, resulting in massive deforestation that made Kinmen vulnerable to soil erosion. The Prince of Lu, a member of the Southern Ming Dynasty, resisted the invading Manchu Qing Dynasty forces. In 1651, he fled to Kinmen, which the Qing dynasty took in 1663. After the establishment of the Republic of China (ROC) in 1912, Kinmen became part of Fukien Province. Japan did however occupy Kinmen during the Second Sino-Japanese War from 1937 to 1945. After the establishment of the People's Republic of China (PRC) in October 1949, it was later claimed by both the ROC and PRC. The People's Liberation Army extensively shelled the island during the First and Second Taiwan Strait crises in 1954–1955 and 1958 respectively. In 1954, the United States considered responding by using nuclear weapons against the PRC. Kinmen was originally a military reserve, which eventually led to the tragedy of 1987 Lieyu massacre. The island was returned to the civilian government in the mid-1990s, after which travel to and from it was allowed. Direct travel between mainland China and Kinmen re-opened in January 2001 under the mini Three Links, and there has been extensive tourism development on the island in anticipation of mainland tourists. Direct travel was suspended in 2003 as a result of the SARS outbreak, but has since resumed. Many Taiwanese businessmen use the link through Kinmen to enter the Chinese mainland, seeing it as cheaper and easier than entering through Hong Kong. However, this changed following the 2005 Pan-Blue visits to mainland China and the 2008 presidential and legislative victories of the KMT, that allowed easier Cross-Strait relations. Kinmen has experienced a considerable economic boom as businessmen relocate to the island for easier access to the vast markets of the PRC. On 30 June 2014, Dadan Island and Erdan Island were handed over from the military to civilians, represented by Kinmen County Government. Since 1 January 2015, tourists from Mainland China could directly apply the Exit and Entry Permit upon arrival in Kinmen. This privilege also applies to Penghu and Matsu Islands as means to boost tourism in the outlying islands of Taiwan. The people of Kinmen see themselves as Kinmenese, Mínnánrén (people of Southern Fujian), or Chinese, but not so much as Taiwanese. The strong Chinese identity was forged during the period of the ROC's military confrontation with the People's Republic of China (1949–1992) when Kinmen was under military administration. In the 1980s, as the militarization decreased and martial law was ended on Taiwan, the Taiwan independence movement and efforts in de-Sinicization grew in strength on Taiwan. To Kinmenese, however, these developments were viewed with concern and there was a feeling that "Taiwan didn't identify with Kinmen". Many worried that Taiwanese de jure independence from China would lead to the severing of ties with Kinmen. These concerns play a strong role in Kinmenese politics as well. Many of the county's inhabitants speak Hokkien; the Quanzhou accent is predominant. Most residents will say they speak "Kinmenese", as opposed to "Taiwanese" as it is commonly called in Taiwan, though the two dialects are mutually intelligible. The residents of Wuchiu Township speak Pu-Xian Min, as opposed to Hokkien for the rest of Kinmen. Kinmen is notable for a number of cultural products. Due to the extensive shelling by the People's Liberation Army in the 1950s, Kinmen is famous for its artillery shell knives. Local artisans would collect the vast amounts of exploded ordnance and make high-quality knives which are still sought after by chefs and connoisseurs. Kinmen is also home of the regionally famous Kinmen Kaoliang liquor, a spirit ranging between 38 and 63 percent alcohol, which is highly appreciated by the Taiwanese. Other local culinary specialties include Kinmen noodles [zh], kòng-thn̂g [zh] and beef jerky (bakkwa). Like the Ryukyus, Kinmen is known for shisa (wind-lion god) figures (風獅爺). Kinmen's economy is mainly based on tourism and services due to its proximity to mainland China. A 5.4 km (3.4 mi) bridge connecting Kinmen Island (Greater Kinmen) and Lieyu is planned to be completed by 2020, estimated to cost NT$7.5 billion (US$250 million). It is expected to increase local tourism; the bridge's 1.4 km (0.87 mi) main body will have the largest span in the world when completed. The Juguang Tower ("Brightness of Ju"), a famous landmark in Kinmen. Because of its military importance, development on the island was extremely limited. Only by 2003, Kinmen opened up itself to tourists from Fujian in Mainland China. It is now however a popular weekend tourist destination for Taiwanese and is known for its quiet villages, old-style architecture and beaches. Chinese and Taiwanese tour groups also spend a short time touring the island whilst transiting between the ferry and the airport, as an intermediate stop between China and Taiwan Island. Large parts of Kinmen form the Kinmen National Park which highlights military fortifications and structures, historical dwellings and natural scenery. The year 2014 recorded the highest number of passengers traveling by ferry between Kinmen and Fujian ports for as many as 1.5 million people. Starting 1 January 2015, Chinese mainland tourists will no longer be required to apply for Exit and Entry Permit in advance for visits to Kinmen, Penghu and Matsu Islands. Instead, they can apply for it upon arrival at a cost of NT$600. By 2016, two infrastructure projects are expected to boost tourism and meetings, incentives, conferencing, exhibitions visitors to the islands. One includes a yet-to-be-named five-star resort spearheaded by Xiamen property developer, Wu Youhua, president of Xiamen Huatian Group, the first time a Chinese interest has been allowed to invest in the Taiwan hotel sector. August 23 Artillery Battle Museum, Guningtou Battle Museum, Hujingtou Battle Museum, Yu Da Wei Xian Sheng Memorial Museum. Gugang Lake, Jiangong Islet, Jincheng Seaside Park, Kinmen National Park. Deyue Gun Tower, Gulongtou Zhenwei Residence, Jhaishan Tunnel, Juguang Tower, Kinmen Folk Culture Village, Kinmen Military Headquarters of Qing Dynasty, Mashan Broadcasting and Observation Station, Mofan Street and Wuqiu Lighthouse. Kinmen is famous for the production of Kaoliang wine, which takes up about 75% of Taiwan's market share, in which it is a strong economic backbone of the county. Traditional industries are also being kept and improved, ranging from agriculture, fishery and livestock. It has a good fishery industry also due to its nature being surrounded by unpolluted sea. Kinmen also produces its unique Kinmen knife, in which the raw material used to produce it is taken from the remaining of shells fired by the People's Liberation Army in 1958-1978. The knife was made as gift to the visiting Head of Taiwan Affairs Office Zhang Zhijun to Kinmen on 23–24 May 2015 to symbolize mutual peace between the two sides of the Taiwan Strait and to bury the hatchet left from Chinese Civil War. Kinmen often import more goods from Mainland China than Taiwan Island because of lower costs due to the proximity of the county to the mainland despite lower quality. During the campaign for the 2014 county magistrate, all of the magistrate candidates spent their money on campaign materials produced in mainland provinces, such as Guangdong, Zhejiang and Fujian instead of from Taiwan Island. The island consistently votes for the Kuomintang (KMT). Until the early 1990s, proponents of Taiwan independence argued that they would consider handing Kinmen over to the PRC in any negotiated settlement. Residents of the island have broadly opposed such measures, fearing the consequences of the PRC government's policies on their standard of living and political freedom. The Democratic Progressive Party has a minor presence on the island and typically does not present candidates to stand in local elections, although it does hold a single seat in Kinmen County Council from both of the 2009 and 2014 local elections. However, the party occasionally lends support to liberal or center-left candidates. On 29 November 2014 however, independent candidate Chen Fu-hai won the county magistrate election and took office as the Magistrate of Kinmen County on 25 December 2014, the first independent candidate to win the office. He replaced Magistrate Lee Wo-shih of the Kuomintang. The 2014 Kinmen County magistrate election consisted of 10 candidates, the highest number of nominated candidates in the electoral history of Taiwan. Kinmen County Constituency is represented by asingle seat in the Legislative Yuan. The incumbent Magistrate of Kinmen County is Yang Cheng-wu of the Kuomintang. 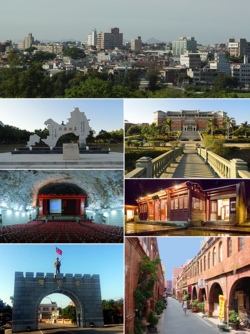 Kinmen County is divided into 3 urban townships and 3 rural townships. Jincheng Township is the county seat which houses Kinmen County Government and Kinmen County Council. The township also houses the headquarter office of Fujian Provincial Government. Kinmen County has the least number of rural townships among other counties in Taiwan. All those townships on Greater Kinmen Island start their names with Jin (i.e., Kin, lit. "gold"). Lieyu Township encompasses the entire Lesser Kinmen Island, and is the closest to Xiamen. Wuqiu Township comprises Greater Qiu Islet (大坵) and Lesser Qiu Islet (小坵). Jincheng and Jinsha are the largest of the six townships. Altogether, there are 37 Kinmen villages, three of which – all in Zhèn (鎮) – are Lǐ-villages (里); the rest are Cūn-villages (村). In August 2010, National Quemoy University was established from the predecessor National Kinmen Institute of Technology and Kinmen Division of National Kaohsiung University of Applied Sciences established in 1997. It is located in Jinning Township. The islands also have a satellite campuses of Ming Chuan University and National University of Kaohsiung. Secondary educational institutions include National Kinmen Senior High School and National Kinmen Agricultural and Industrial Vocational Senior High School. In total, there are 24 junior high schools, elementary schools and kindergartens. The Kinmen County Government have invested millions in education in Kinmen, with an average of NT$20,000 per student. Schools in the county also accept the growing number of Taiwanese students whose parents are doing business in Fujian. The county government has been striving to encourage universities in Taiwan Island and Mainland China to set up branches in the county, as well as to attract Chinese mainland students to study in Kinmen. The Kinmen Power Company was founded in 1967 and gradually built five power plants in the county and in charge of providing power resources to all residents in Kinmen. It used to rely on light diesel oil which created high cost burden to its management. Since 1992, the ROC central government approved the power company to authorize Taiwan Power Company (Taipower) for five-year management. All of the power development projects were invested by Taipower and helped the region economic development. In July 1997, Kinmen Power Company was officially incorporated to Taipower. In 1999, the diesel-fired Tashan Power Plant was built to supply electricity to Kinmen grid. The other smaller power plants were subsequently discontinued to reduce cost. In August 2012, Kinmen and Xiamen established the first submarine telecommunication cable between the two sides. On Taiwan side, the infrastructure was constructed by Chunghwa Telecom, while on Mainland China's side was done by China Telecom, China Unicom and China Mobile. The project was initially launched in 1996 and took 16 years to build. The telecommunication system consists of two cables, one is a 11 km (6.8 mi) long cable that runs from Kinmen's Lake Tzu and Xiamen's Mount Guanyin, and the other is a 9.7 km (6.0 mi) long cable that runs from Kinmen's Guningtou and Xiamen's Dadeng Island. The system is a non-repeater system with a bilateral transmission capacity of 90 Gbit/s, which might be expanded in the future if demand arises. The current daily water demand for Kinmen is 50,000 tonnes, which are used for households, industries and agriculture sectors. One tonne of water produced for Kinmen costs about NT$50–60 and may surge to NT$70 during summer. In extreme drought condition, water shipment from Taiwan Island may cost as much as NT$200 per tonne. Because Kinmen residents pay only NT$10 for each tonne water they use, the cost of water supply has become a heavy burden for the county government. For decades, Kinmen has been facing difficulties in water supply to its residence due to its shallow lakes, lack of rainfall and geographical constraints which makes building reservoirs and dams unfeasible. Therefore, Kinmen often overuses its groundwater, causing rising tidal flood and soil salinity. In early September 2013, the People's Republic of China government agreed to supply Kinmen with water from Jinjiang City in Fujian due to the ongoing water shortage problem in Kinmen. Kinmen draws more than 8,000 tonnes of groundwater every day and water from its reservoir is barely enough to support the residents during the dry season. The shortage problem will heavily hit the local economy by 2016 if no mitigation plan is enacted. The water supply agreement was officially signed on 20 July 2015 in Kinmen between Kinmen County Waterworks Director Weng Wen-kuei (翁文貴) and Fujian Water Supply Co chairman Zhu Jinliang (朱金良) witnessed by Kinmen County Magistrate Chen Fu-hai and Fujian Province Governor Su Shulin. The water pipeline was officially opened on 5 August 2018 when the first water supply was delivered in a ceremony held in both Kinmen County and Jinjiang City in Mainland China. 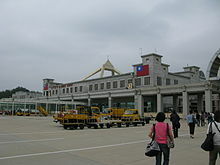 Kinmen is served by Kinmen Airport, a domestic airport located at Jinhu Township, connecting Kinmen with Magong Airport, Penghu and Taipei Songshan, Kaohsiung, Taichung, Chiayi and Tainan Airport on Taiwan Island. People coming from Mainland China can also visit Kinmen using ferry via Fujian from Xiamen at Wutong Ferry Terminal or from Quanzhou arriving at Shuitou Pier in Jincheng Township. Kinmen to Xiamen Ferry, is a popular route between the Chinese Mainland and Taiwanese tourists alike, with brisk connections available between the ferry ports and Kinmen Airport (for Taiwanese destinations) and Xiamen's Airport and Xiamen North Railway Station (for Mainland destinations). The Kinmen-Quanzhou Ferry is only available to local travellers and foreigner passport holders are not permitted to use this service. A new commercial port has been built adjacent to the Shuitou Pier on newly reclaimed land. This will handle the majority of sea freight to and from Kinmen. Previously most of this traffic was handled by a smaller port on the South-East corner of the island in Jinhu Township. In the past, due to constant artillery shelling from the Chinese mainland, an underground port was used to supply the island in times of conflict at the Jhaishan Tunnels on the South-Western tip of the island but this has been decommissioned and turned into a tourist attraction. Greatly used as a transit route between the Chinese Mainland and Taiwan Island, buses also connect to the ferry terminal to allow for quick transfer to the Xiamen. Calligraphy by former President Chiang Kai-shek etched on a rock in Kinmen reads, "Forget not what happened in Jǔ" – an allusion to the Warring States period when the State of Qi, cornered into the City of Ju by the State of Yan, successfully counterattacked and retook its territory. This is intended as an analogy to the situation between the Republic of China and the People's Republic of China. Other slogans alluding to "retaking the mainland" can also be found in Kinmen. ^ In 1949, the Republic of China government led by the Kuomintang (KMT) lost the Chinese Civil War to the Communist Party of China (CPC) and retreated to set up a provisional capital in Taipei, which serves as the ROC's seat of government to this day. The CPC established the People's Republic on the Mainland. As such, the political status of the ROC and the legal status of Taiwan (alongside the territories currently under ROC jurisdiction) are in dispute. In 1971, the United Nations gave the China seat to the PRC instead of the ROC. Most states recognize the PRC to be the sole legitimate representative of all China, and the UN classifies Taiwan as "Taiwan, Province of China". The ROC has de facto relations with most sovereign states. A significant political movement within Taiwan advocates Taiwan independence, which would most typically include Kinmen county. ^ Jian-Feng Wei. "An Examination of Cultural Identity of Residents of Quemoy (Kinmen)". Intercultural Communication Studies. XV:1. 2006. p. 134. Retrieved 20 January 2012. ^ a b Jian-Feng Wei. "'Quemoy' or 'Kinmen'? : A Translation Strategy for Communication". Intercultural Communication Studies. XVIII: 2. 2009. p. 176. Retrieved 20 January 2012. ^ a b c d e f g Trista di Genova. "Study explores the 'Kinmen Identity'". China Post. 11 July 2007. Retrieved 20 January 2012. ^ For example, National Geographic Maps. ^ a b "History". lonelyplanet.com. Lonely Planet. Archived from the original on 2016-04-20. Retrieved 2016-05-24. ^ Wakeman, Frederic (1986). The Great Enterprise : The Manchu Reconstruction of Imperial Order in Seventeenth-Century China. University of California Press. p. 114. ISBN 0-520-04804-0. ^ Wong, Edward; Yang, Xiyun (September 16, 2011). "Once a Redoubt Against China, Taiwan's Outpost Evolves". The New York Times. ^ "Headline_Taiwan Affairs Office of the State Council PRC". ^ "Jiang hopeful of Chinese landing visas to islands". Taipei Times. 1 Jul 2014. p. 3. ^ Jian-Feng Wei. "An Examination of Cultural Identity of Residents of Quemoy (Kinmen)". Intercultural Communication Studies. XV:1. 2006. p. 136–137. Retrieved 20 January 2012. ^ "Wind Lion God" at the Kinmen National Park website. 6 June 2009. Retrieved 20 January 2012. ^ "news". Chinataiwan.org. Retrieved 2012-01-01. ^ "Construction of Kinmen Bridge begins". Focus Taiwan News Channel. 2011-01-09. Retrieved 2011-01-09. ^ "Construction for Kinmen Bridge Begins and President Ma Hopes It Becomes a New Landmark for Kinmen". Kinmen.gov.tw. Retrieved 2014-05-19. ^ "Taiwan's Kinmen Island visited by Chinese - Taiwan Holidays - Australia's #1 Taiwan Travel Specialist, Taiwan Tour Wholesaler, Escorted Group Tour, Taiwan Holiday Package, Round Taiwan Island Tour, Taiwan Taipei Stopover, Taiwan Hotels, Taiwan Group Tour, Taipei Day Tour". Taiwan Holidays. Retrieved 2014-05-19. ^ "Over 1.5 mil. have ridden with Kinmen-Fujian ferry". The China Post. ^ "Taiwanese offshore islands to ease travel for Chinese from Jan. 1". Focus Taiwan. ^ "MICE development hits Kinmen". TTGmice. Retrieved 10 December 2012. ^ "Invest in Kinmen". Investkinmen.com. Retrieved 2014-05-19. ^ "Kinmen knives symbolize cross-strait peace: Chinese official". Retrieved 11 September 2015. ^ "Kinmen candidates prefer China-produced campaign materials". Archived from the original on 19 January 2015. Retrieved 11 September 2015. ^ "Independent Chen Fuhai wins Kinmen magistrate race". wantchinatimes.com. Archived from the original on 10 December 2014. Retrieved 5 November 2016. ^ "9-in-1 Elections' campaigns run hot in Taitung and the outlying islands". The China Post. ^ "Constituency Legislator Election Kinmen County Constituency Ballots cast of Candidates". Central Election Commission. ^ "Kinmen technology institute upgrades to National Quemoy University – What's On Xiamen". Whatsonxiamen.com. 2010-08-08. Retrieved 2012-01-01. ^ a b "Kinmen Awareness". Kinmen County Gov't. Archived from the original on 8 March 2016. Retrieved 5 November 2016. ^ "Students get green light to study in Kinmen". Retrieved 11 September 2015. ^ "Invest in Kinmen". Retrieved 11 September 2015. ^ a b "Chunghwa Telecom hails submarine cable to Xiamen". Taipei Times. 22 Aug 2012. p. 3. Retrieved 2014-05-19. ^ "Kinmen-Fujian water pipeline to be agreed at upcoming cross-strait talks". Retrieved 11 September 2015. ^ "Kinmen water deal not a security risk: official". Taipei Times. ^ Lu, Yi-hsuan (6 August 2018). "Kinmen starts importing Chinese water". Taipei Times. Retrieved 20 April 2019. ^ "Ferry from Xiamen to Kinmen, Taiwan | Travel Guide". Amoytrip.com. 2012-08-25. Retrieved 2014-05-19. Wikimedia Commons has media related to Kinmen. Kinmen Island: China without the Communism? Pictures : Taiwan on China's shores. Reuters.